Sasami Tsukuyomi has been attempting to pass her first year of high school despite being a shut in. Fortunately, her older brother Kamiomi happens to be a teacher at the school she is supposed to attend. With the use of the “Brother Surveillance Tool” she can view the outside world via her computer. Theoretically it should be helping her adjust to interfacing with people again... Instead, it's giving her an up close and personal view of the very odd Yagami sisters who have various types of “interest” in Kamiomi. 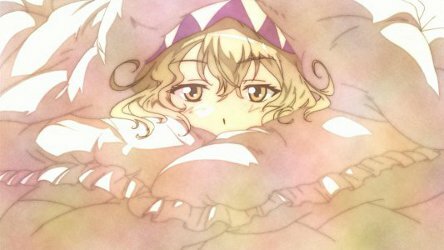 It looks like Sasami will have to take off her pajamas and go out into the “real” world to set things straight in Sasami-san@Ganabaranai. Preview by Doraku: SHAFT once again successfully made me confused – in a good way, like SHAFT usually does. Sasami-san@Ganbaranai is filled with wacky dialogues and peculiar characters (most notable examples: a brother who is always hiding his face and possibly a siscon; the main character is a NEET/hikkokomori who could not get outside at all), but the amount of ridiculousness is not over-the-top, so instead of turning off your interest, first episode of Sasami-san@Ganbaranai would increase your curiousity on what on earth just happened during the first episode. The animation quality of reminds me of Madoka Magica instead of Bakemonogatari. I was expecting that Shinbou would add crazy sentences in-between scenes like what he did in Bakemonogatari series, only to found out the amount of surreal words putted is not as intense as Bakemonogatari. Bottom line, for those who are familiar with SHAFT’s productions and Akiyuki Shinbou, this Anime is clearly perfect for you. I would argue that Sasami-san@Ganbaranai has a huge potential to become a hit and enjoying a considerable amount of success would not be a far-fetched idea for Sasami-san@Ganbaranai. Preview by Kaiten: Sasami-san@Ganbaranai is the newest SHAFT franchise, once again featuring the studio's baffling, eye bending signature visual style. While lighter on the wordplay than either the Sayonara Zetsubou Sensei franchise or Monogatari series, Sasami-san is nevertheless another prime example of SHAFT creativity. I'm still at somewhat of a loss for words after episode one, still trying to process what exactly happened. Like my first viewing of Bakemonogatari, I'm no entirely sure, though I do know I really liked it. New SHAFT is always a treat, a new franchise is especially fun. Preview by Josef K: One of the best shows in this season opens up with a weird brother/sister interaction. It just starts getting weirder and weirder with every passing second. Sasami-san can be taken as some sort of slice of life comedy with a weird supernatural twist. It can be taken as a symbolic anime, a giant metaphor, or a giant allegory. No one actually has a clue to what is going on but is captivated by the awesomeness. The characters are so individualistic and have such distinct personalities that you might like them and hate them all separately. Not that many yo begin with but the ones we have are very well built. The art style is very interesting and takes you in a sort of trance when you are watching it, it playful yet there is a little dark sub tone to it. I personally like it, but you need a large portion of your attention to watch this and pick up the little details, as I have probably missed a lot in just 2 episodes, it's one of those anime that you know you are going to have to re-watch after the end and at the same time feel sad that it ended.